The Orbit360 (formerly called 4KVR360) was at Kodak PIXPRO’s booth at NAB Show 2017. I found out the price and other info. According to the representative I spoke with, there are two camera packages: the Adventure Pack and the Satellite Pack. The Adventure Pack includes the Orbit360, a tripod / mini-handle, a mini remote control, charger, lens caps, USB cable, and a camera case. See the unboxing video here. The Adventure Pack is $499, before any applicable discounts. I didn’t see the Satellite Pack, but according to the representative, the Satellite Pack includes the Orbit360, a selfie stick, a 1/4-20 to GoPro adapter, and a wearable remote similar to that of the SP360 4K, which can switch between photo and video and switch between render modes (360 or otherwise). The Orbit360’s remote will still be powered by a watch battery instead of being rechargeable. The Satellite Pack costs $549, also before any discounts. You can get a discount by using the code CES2017. Not exactly sure what the discount will be, or whether there is a different discount available to 360 Rumors readers. The Kodak representative “hopefully around 4 to 6 weeks.” Meanwhile, she confirmed that we would have samples soon. 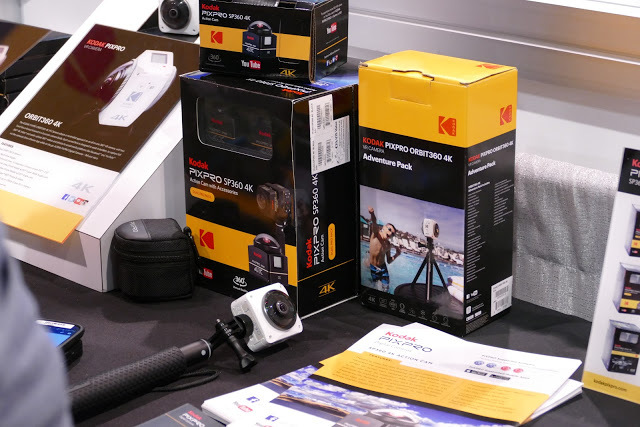 The Kodak representative said that after the launch of the Orbit360, Kodak would continue to sell the SP360 4K Dual Pro, which they said would be their professional model, which the Orbit360 would be the consumer model. That’s because…. The Kodak representative said that the SP360 4K still has higher image quality than the Orbit360. This is surprising to me, because the rear lens is the same as the original SP360 4K, and the new front lens seems sharper than the rear lens. This is also contrary to the information another Kodak representative told me at VRLA. She said that professionals might not be satisfied with the Orbit360’s stitching, whereas consumers might want the Orbit360’s convenience and ease of use. I think the better course right now is to wait for the samples. Let’s see what the Orbit360 image quality is really like and judge for ourselves.